● description of six practical projects which range from the simple to the highly sophisticated, but all give exceptional performance. 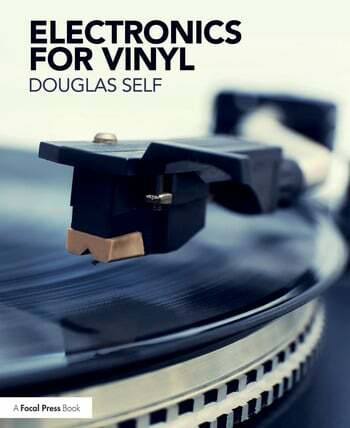 Electronics for Vinyl brings the welcome news that there is simply no need to spend huge sums of money to get performance that is within a hair’s breadth of the best theoretically obtainable. But you do need some specialised knowledge, and here it is. Douglas Self studied engineering at Cambridge University, then psychoacoustics at Sussex University. He has spent many years working at the top level of design in both the professional audio and hi-fi industries, and has taken out a number of patents in the field of audio technology. He currently acts as a consultant engineer in the field of audio design.